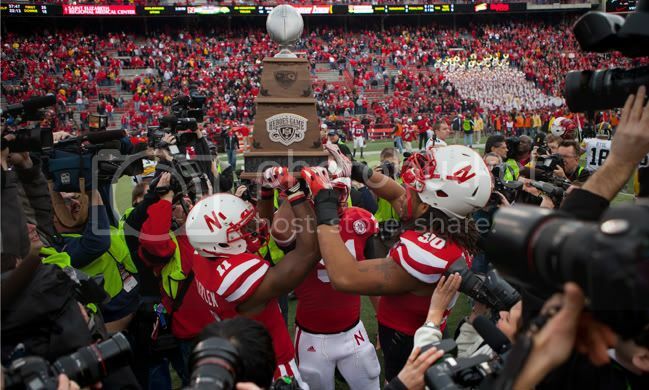 Nebraska seniors Curenski Gilleylen and Terrence Moore and redshirt freshman Donovan Vestal celebrate with the Corn Bowl Trophy. The Huskers beat Iowa 20-7 in the inaugural Heroes Game. John Duncan was heading for the exit, his Hawkeyes losing 20-0. His father-in-law, Tim Cahill, kept jabbing him in the sides with the elbow of his scarlet-hooded sweatshirt, flaunting his Huskers’ eminent victory. The Huskers would go on to win 20-7. “He’ll be a Nebraska fan after today,” Cahill said. Cahill said the teasing is all in good fun. There’s no bad blood in this rivalry. The Heroes Game, as it’s officially called, brings together two fan bases from farming states – Iowa, “The Corn State,” and Nebraska, “The Cornhusker State.” The two teams have each been called the Hawkeyes at times, Nebraska’s tenure with the name ending in the late 1800s. The game between Iowa and Nebraska, which is set for the Friday after Thanksgiving for the foreseeable future, is the first time the two have played since 2000, when Nebraska quarterback Eric Crouch threw for five touchdowns en route to a 42-13 victory. Nebraska has now won four straight in the series, which it leads with an all-time record of 27-12-3. Hansen, as well as other fans of both Iowa and Nebraska, says this rivalry will be more positive and will reflect the mild-mannered reputation Midwesterners have. “(The rivalry is) the exact opposite of the Colorado rivalry in my view,” said Hansen, who said the rivalry with Colorado was defined by poor sportsmanship by the Buffaloes. Iowa fans filled about 15 percent of Memorial Stadium, which had more than 85,500 in attendance. Iowa has routinely sold out its stadium, building a sellout streak of 36, which ended in 2008. Nebraska has the NCAA record for consecutive sellouts at 319.